Ferplast ErgoComfort Fluo Dog Collar (Pink) is an ergonomically designed collar with a soft inner padding to ensure maximum comfort for your dog. Made from strong nylon and polyurethane, the collar is available in a bright fluorescent colour and features an effective and patented closing system with micro regulation, so that it can be adapted perfectly to your dog’s size. The closing system also allows for a quick release if it needs to be unlatched in an instant. 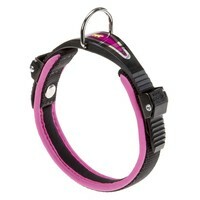 Features a strong metal D ring to fasten a lead securely too.